As director of UC Santa Barbara’s Center for Taiwan Studies, Kuo-Ch’ing Tu is determined to promote Taiwan-related scholarly activities in the United States. The center seeks to research Taiwan Studies from an international perspective, mainly raising awareness about Taiwan in the international community and providing scholars a better understanding of Taiwan Studies as a discipline. Earlier this year, the Center for Taiwan Studies hosted a conference titled “World Literatures in Chinese: Transnational Perspectives of East Asian Cultures,” in collaboration with a Korean university research group on Chinese and Japanese language and culture. The conference explored literature written in Chinese that had developed in East Asia under the influence of Chinese culture. Scholars from China, Japan, Korea, Taiwan and the United States all gathered at UCSB for the event. Kuo-Ch’ing Tu making the opening remarks at the “World Literatures in Chinese” conference at UC Santa Barbara earlier this year. A literature scholar, Tu helped expose western modernism in Taiwan in the 1960s through translation of T.S. Eliot’s works. His translation into Chinese of the French poem “The Flowers Of Evil” by Charles Baudelaire was considered its first full translation at that time. 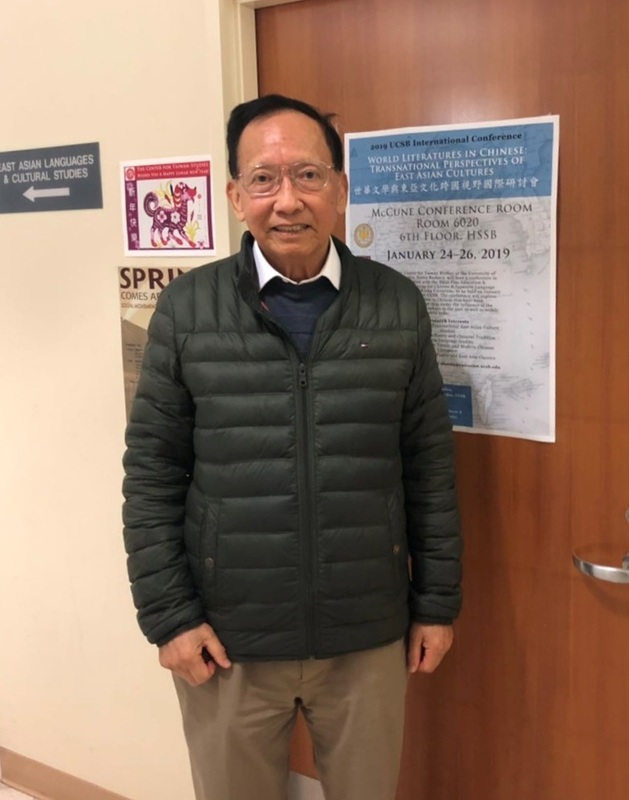 I had the opportunity to interview Kuo-Ch’ing Tu about the recent international conference and his work at the Center for Taiwan Studies at UCSB. Q. How does the Center for Taiwan Studies organize events like this conference? A. The Center for Taiwan Studies organizes a conference every 1 to 2 years. After the theme has been decided, we send out letters to the scholars to have them write papers on the topic to present on the conference. This year, we collaborated with Korea’s research group Brain Korea 21. Because there are many young scholars, I didn’t want to limit the topic only to Taiwan, but also included World Literature in Chinese. The conference covered different topics. This is something very special in the Center at UCSB. The main purpose is to promote Taiwan studies, so the best way is to have some interaction with scholars in the field. Kuo-Ch’ing Tu, director of UC Santa Barbara’s Center for Taiwan Studies, outside his office. Q. Why did you want to promote Taiwan studies in the United States? A. The concept of Taiwan Studies started in the 90s when colleges started to establish departments and centers for it. I thought it was about time. In 1994, I discussed my plan with the director of the Interdisciplinary Humanities Center. Because the idea of Taiwan studies was still new, I created a sub unit under IHC on World Literature in Chinese. We started to publish the Taiwan Literature English Translation Series to translate Taiwan’s Literature into English. Q. How did the journal helped with promoting Taiwan Studies? A. I started the journal in 1996. After three or four years, in 2000, the journal caught San Diego Taiwan Center’s attention. They invited me to give a speech at San Diego’s Taiwan Center. After the speech, they understood that I am determined to promote Taiwanese literature through English translation. So, this is why UCSB received the $500,000 donation in 2003 for the endowment to finally establish the Center for Taiwan Studies to carry out the project I had in mind. The journal has lasted 22 years, it has published 43 issues. Each has a theme such as aboriginal myths and legends, Taiwan Literature and Haka culture. I even translated literature written under Japanese colonization, written in Japanese, into English. Q. How did you translate works that are written in Japanese? A. My background is a bit special. I first got my English degree from Taiwan, then I studied abroad for four years in Japan for my masters degree in Japanese Literature. Finally, I came to Stanford for Chinese Literature. I was able to do translation without too much distortion of the original text. Q. What are the areas that the Center for Taiwan Studies is working on? A. The Center now provides editing assistance to continue the journal’s publication. In recent years I put my focus on conferences and education. The journal provides a basis for teaching material. Educators can find representative works translated to English in the journal. There are also courses such as Special Topics on Taiwan Studies. Each year we have six or seven visiting scholars to give lectures. The first speaker this year talked about Taiwan’s political science. I thought students would be interested in it. Ao Yu Hsiao is a fourth-year international transfer student from Taiwan, majoring in Statistics at UC Santa Barbara. He conducted this interview for the Writing for Web and Social Media course in the Division of Humanities and Fine Arts.